Darkain has released a new version of his Loader for the Nintendo DS. To read more of the post and Download, click here! Neo Power Kit v1.1 ! - Added the SRAM backup and restore function(but for english module only), now you can backup your NDS/GBA save to PC and you can modify it then restore to the NEO cart,in this version just support whole 2Mb save data backup and restore,and we don't make the backup progress bar yet,it'll take 10 seconds to backup 2Mb data to your PC. - Can support XG2005 serial now. You can buy the NeoFlash GBA and DS flash kit from <a href="http://www.linker4u.com/affiliatewiz/aw.asp?B=157&A=244&Task=Click" target="_blank" >Here</a>. Thanks to <a href="http://emuholic.emuboards.com/modules.php?name=News&file=article&sid=833&tbid=4" target="_blank" >Guyfawkes</a> for the news. Speaking at a shareholder's meeting in Japan earlier this week, Nintendo president Satoru Iwata admitted that the Nintendo Revolution console may arrive on the market after Sony's PS3 - but said that it will not "fall behind by too much." In a marked departure from the company's promise at E3 three years ago that it would not be the last out the door in the next-generation, Iwata gave a guarded response to a question about whether Nintendo would fall behind its rivals in terms of launch timelines. "There is no possibility that the Revolution's launch will fall behind by too much," he said, according to comments translated by GameSpot, "but there might be some small changes [in its release schedule]." Nintendo has never put a date more solid than 2006 on its console, while Sony intends to roll out the PlayStation 3 in Spring 2006 in at least one territory; so of course, whether Revolution is last to the table or not depends as much on how Sony's schedule proceeds as on Nintendo's own timing. However, while Nintendo may launch after PlayStation 3, the company has revealed that it will be launched at a significantly lower price point than its rivals. Download <a href="http://gbaemu.dcemu.co.uk/pocketnes.shtml" target="_blank" >Here</a>. Download over 100 Homebrew Nes Roms <a href="http://xbox-emulation.dcemu.co.uk/nes-roms.shtml" target="_blank" >Here</a>. SD adapter for GBA/Nintendo DS ! Game cheat function. Can operate at any time when playing game. Super Card SD TO GBA SUPER CARD is a miniature mobile GBA(SP) file Manager and Bakup device. Fore backuping files it uses SD card. It allows you to run a variety of software, Play Game, Watch movie, E-book, Music and Photo albums. All version of Super Card support GBA, GBA SP and NDS. Super Card is easy to operate. Just use the bundled software to convert GBA games and copy them to SD card. Then, you are ready to enjoy the games. Added suppert for 2nd screen, and Screen swapping when writing. * Implemented coprocessor 15 ability to switch ARM9 vector execution address from 0xffff0000 to 0x00000000. Required for DSLinux to work. Unfortunately DSLinux still doesn't run under DSEmu but it's a step on the way. * Fixed implementation of ARM opcodes that used suffix 'S'. These weren't dealing with the spsr and cpsr correctly. * Implemented timers 0, 1, 2 and 3 and attempted to get them running at approximately the right rate. * Got keyboard interrupts working. Tutorial eight now works in DSEmu. * Implemented coprocessor 15 ability to switch the ARM9 into low power mode. * Changed SWI 4 and SWI 5 implementation to use coprocessor 15's instruction to switch into low power mode, and implemented in ARM assembly in the fake ARM9 BIOS instead of C. This works much more like the actual DS hardware now. Previously SWI 4 and 5 only really worked for the vertical blank interrupt, now it works for all interrupts. * Fixed some timing issues with interrupts and low power mode. Quick & dirty port of SnesAdvance. Flash a SNES rom to GBA cart (SMC format, 512 byte header). Thanks to Vanhammer for the file/news. <a href="http://www.emuboards.com/invision/index.php?showtopic=22927" target="_blank" >Sephiroth87</a> has released the worlds first Chip 8 emulator for the Nintendo DS. Tons of fixes in this version, most songs sound quite a bit better. Check out the readme.txt in the archive for how to set things up. Note that you need the .NET framework 1.1 installed to run the rom builder. Up/Down - move the current selection. The name on the top is the SPC that will be played. Here is a GUI add-on for WMB/WiFiMe that has the following cool features. NesterDS v0.2 now available on the DS page. This version includes sound and some other improvements. Goodnight. (6/7/2005) Made a soundless version (for better compatibility). (6/7/2005) Fixed a bug so it works with PassMes. (6/7/2005) Made a build tool (a modified snesadvance builder, works with "superdat" file). (6/7/2005) Minor gfx bug fixed. (5/7/2005) Made a cart-only version. Thanks to Loopy for a great release, download from here --> <a href="http://nintendo-ds.dcemu.co.uk/snesds.shtml">http://nintendo-ds.dcemu.co.uk/snesds.shtml</a> or <a href="http://home.utah.edu/~u0422123/snesDS/" target="_blank" >Loopys wip page here</a>. mfe-distro is out! The Mini (MPlayer) Front-End Distro proof of concept is a small gc-linux distribution designed to play your media files directly from the GameCube DVD drive. It doesn't require a BroadBand Adapter, and is completely joypad driven. It makes use of the "mfe" front-end and includes an enhanced Simple Directmedia Layer with kirin's latest YUV acceleration code. Read a bit more about it and download it. NOTE: modchip users may need to use an updated mfe-boot.dol. Last week, rumors began to surface that the Xbox 360 would allow gamers to download Micrsoft-developed games onto Nintendo's DS handheld. Given that Nintendo's handhelds are its main source of revenue, Microsoft creating new content for the DS would be giving ammunition to its archrival in the current- and next-generation console wars. Such a move struck many industry-watchers as being highly unlikely, if not outright lunacy. However, it now appears that Microsoft may be crazy like a fox. This week, evidence surfaced confirming that the company is indeed developing games for the DS. It came in the form of two job listings on the official Web site for Rare Ltd., the Britain-based developer of Conker: Live and Reloaded for the Xbox and Perfect Dark Zero for the Xbox 360. Rare is wholly owned by Microsoft, and is part of its Microsoft Game Studios suite of internal developers, which also includes Halo-makers Bungie Software. The first advertisement, under the "Artist Vacancies" subsection, calls for submissions from "EXPERIENCED 3D ARTISTS (NINTENDO DS)." The position requires for a "Good understanding of 3D packages (preferably Maya), strong modeling and texturing abilities, imagination and motivation are all required from anyone hoping to join our Develop award-nominated team in creating key DS titles." The second advertisement, under "Software Vacancies," asks for "GAMES PROGRAMMERS (NINTENDO DS)." Applicants must "be motivated, enthusiastic and skilled in C/C++ to join our dedicated handheld team, recently nominated for a Develop Industry Excellence Award. 3D skills also an advantage in creating high-profile titles for this unique system." Although job listings by a Microsoft-owned studio for DS developers would strike most as definitive proof that the company is making games for Nintendo's handheld, nothing is official--yet. When asked by GameSpot, a Microsoft spokesperson declined comment. "At this time, we have nothing to announce in regards to Rare developing titles for the DS," said the rep.
Ironically, the as-yet-unidentified DS titles will not be the first that Rare has made for Nintendo. Prior to Microsoft's purchase of the studio in, Rare was a Nintendo-only operation, making games exclusively for the Nintendo 64 and the GameCube before Microsoft bought it in 2002. 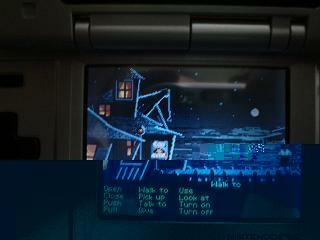 Since then, however, Rare has developed several titles for Nintendo's other portable, the Game Boy Advance. However, these have largely been legacy deals to port existing Rare titles, including last year's remake of its 1985 Commodore 64 game Sabre Wulf and the upcoming version of its 1996 SNES title Donkey Kong Country 3. Being the second RPG spin-off game (we also saw fighting titles and card simulations in the past), Naruto RPG 2 is bringing the adventure from the GBA to the Nintendo DS, courtesy of Tomy. Earlier on, Bandai made the first move, transferring the Naruto: Saiyou Ninja Daikesshuu series from the Game Boy Advance to the DS for part 3. Storywise now, Naruto RPG 2 will apparently follow the events leading from the aftermath of the Naruto/Gaara fight up through Naruto's fight with Sasuke. Tomy has announced that players will use the touchscreen particularly during combat. Wielding your stylus, you will have the opportunity to manage your team by modifying the position of the characters when focusing on the battles. According to the developer, Naruto RPG 2 should also feature an online mode via Wi-fi, allowing exchanges and confrontations between friends. Naruto RPG 2 definitely goes beyond a "mere" Beat'em Up title, with enough story depth to fully devote yourself to the Naruto universe, mobile style! Shipping on July 14th for only US$ 49.90, this great import is of course eligible for our Free Shipping Worldwide promotion. There's an attack on the UN by a mysterious new terrorist force known as Heaven's Smile! Everyone they touch turns into a mindless walking time bomb with a sadistic grin on their face. Then, just to add to the fun, they blow up everyone they approach, and can turn invisible too. So who does the government call in to save the day? A wheelchair bound assign named Harman Smith. Riggggght. This army of one though, is actually seven split personalities, each more twisted than the last. You can switch between them anytime in game, and each have their own skills to help kill who ever they deem "deserving to die". Need someone knifing? Kevin's your man. Have a hankering for the extra power of two grenade launchers? Say hello to Mask. Others feature lock picking abilities, sniper skills, and more, such as a female that can even use her own blood to break through barriers! In Killer 7 a good bloody splattering doesn't go unappreciated. After a night of your team painting the town red, you bottle the enemies blood and can use it to unlock more powers or restore health, depending on your flavor of choice: thin or thick. Thus the more blood you blow out of an enemy, the better, and the thick stuff lets you personalize each personality even further. Announced three years ago, the unique visuals got almost all the attention with Killer 7, but now the gameplay has been revealed, it seems that same level of creativity flows right through all the veins of this sicko title. Last month the Japanese edition clearly got Famitsu's seal of approval too, with a whopping 36/40 review score, and now the US edition is arriving for GameCube near the end of this week. Rafal 'revo' Kozik has translated some of my tutorials to Polish. They've available on the dsCode site. So far tutorials one, two and three are there. Nice job Rafal. In other news, I have DSEmu partially running dslinux. So far it boots up to the point of trying to mount the root partition at which point it kernel panics. Its still in the early stages, press A to make the worm go up and release to make the worm go down, scoring is not implemented yet and there are some graphic problems still. Could someone test it out on hardware and let me know if it works at least at well as on dualis. (10/7/2005) Sound improvements, minor Mode7 fix. (8/7/2005) Fixed a bug with SRAM, saving should work now. (8/7/2005) ARM9/ARM7 bins provided for building .NDS (wifi-able) roms. Still very hacky, I'll fix it up later. <a href="http://www.double.co.nz/nintendo_ds/dsemu.html" target="_blank" >Chris Double</a> has released a new version of the Nintendo DS emulator, DSemu. IPCSYNC register has been partially implemented. It works except for interrupt support. This allows the E3 commercial download demos to boot a bit further along. Unfortunately they don't actually run yet. Extra logging added to CP15 functions to show where memory regions were assigned and with what protections. Lots of ARM9 instruction fixes which allowed DSLinux to finally boot. It fails mounting the root partition but is much further along than previous versions. Re-enabled some optimisations that were left disabled in 0.4.4. Partial implementation of extended rotation backgrounds. Those demo's using mode 5 should start to work now. No support for scaling, rotating or shearing yet though. Implemented scrolling for extended rotation backgrounds. Added SWI 0xFF for debugging purposes. Calling this SWI with R0 set to a null terminated string will print that string to the log file. Modelled after the functionality in Dualis. Note that SWI 0xFF crashes on hardware. Download from here --> <a href="http://gbaemu.dcemu.co.uk/greenboy.shtml">http://gbaemu.dcemu.co.uk/greenboy.shtml</a>. Download from here --> <a href="http://gbaemu.dcemu.co.uk/murdoc.shtml">http://gbaemu.dcemu.co.uk/murdoc.shtml</a>. cory1492 coded a "Pixel Fixer" for the NDS. It probably should fix dead pixels, but read more at the link below. Source available too. These days if there’s even the tinest smidgen of new information about the Revolution controller there’s usually a storm of controversy over whether or not it’s legit. However, this time the information comes from the mouth of Nintendo president Saturo Iwata himself. He spoke to the UK paper ‘The Guardian’ last week about Nintendo’s new console and it’s revolutionary controller. Nothing too informative but it does reveal what sort of controller they’re hoping to create. Reggie says that “there are too many buttons and sticks on controllers for novice players, which is likely to discourage them from ever playing games at all”. Apparently he wants the Revolution’s controller to be accessible to everyone and he really wants people to “feel like they want to touch and play with it”. Luckily that last comment is in context because otherwise I’d be giggling. According to the latest sales report by Famitsu publisher Enterbrain, hardware shipments of the Nintendo DS outpaced the PlayStation 2 for the month of June in Japan, selling 130,000 units and 100,00 units, respectively. Sony's PSP trailed behind the two consoles with 80,000 units sold during the month. This will be the third consecutive month that the DS has beaten the PlayStation 2 and PSP in hardware sales in Japan. Overall hardware sales for the month of June were up by 62.5 percent compared to last year. According to Famitsu, June's best-selling game was Sega's Mushiking for the Game Boy Advance, which sold 220,000 copies. Square Enix's Drag On Dragoon 2 (Drakengard II) for the PS2 followed in second place with 170,000 copies, while Nintendo's Kahashima Ryuuta Kyouju no Nou o Kitaeru Otona DS Training came in third with 120,000 copies. While sales in hardware were up for June, software sales were down by 12.7 percent compared to last year. Nintendo Europe has confirmed the launch date for the first Nintendo DS instalment of its hugely popular turn-based strategy franchise Advance Wars, with Advance Wars: Dual Strike set to arrive on September 30th. The game, which follows on from the successful GBA duo of Advance Wars and Advance Wars 2: Black Hole Rising, takes advantage of both the dual screens of the DS and the wireless networking functionality. It also features a number of new game modes - including a survival mode and a new combat mode which is actually implemented in real-time, which should be an interesting twist on the genre. The title, which launched in Japan two weeks ago, is due out in the United States a month ahead of the European release, on August 22nd. Nintendo is really pushing their Nintendo Wi-fi hard, completely reversing the anti-online mentality they've held in years past. Nwizard.com reports, "Nintendo will soon be producing a router that will allow access to the Nintendo Wi-Fi Network on both the DS and the Revolution. The router plugs into a USB 2.0 port and transfers your computers internet connection wirelessly into your next-gen Nintendo devices." It should be noted this story came at almost the same time as Sony announced they dropped the PS3's router functionality. Added some changes that have been sitting in my inbox for as much as a month. Microphone code has been added...will do an example in the next day or two. Fixed an error in consol printing and an one in Key input code. Fixed Textured QUAD demo so that it displays a textured QUAD as apposed to a blank screen. Added GlRotate for rotations about an arbitrary axis. Fixed GluLookAt so it should work like it is supposed to. Thanks Neimod for the Microphone code and Bob for the GL additions/changes. As soon as I have the time to port my makefiles over to libnds and modify the examples I am going to begin making changes directly in libnds. I think most people have migrated to that distribution anyway since wntrmute does a much better job of versioning than I as well as verifying cross platform compatibility. This should require little change in ndslib code as the only difference is location of the header files if I am not mistaken. NDS NeoPop - Nintendo DS port of NeoPop ! Hideki Konno, producer of the forthcoming DS Mario Kart, has recently shed more light on what we can expect to see from the fifth game in the series. As previously reported, Mario Kart DS will be one of the first games to utilize Nintendo's new online wi-fi service. Konno has confirmed that Battle Mode will be available to internet-dwelling gamers, alongside four player head-to-head racing. Sporting over thirty tracks in total - fifteen new ones, with classic tracks from previous games making up the rest - gamers will, for the first time, all be able to race as the same character. To avoid confusion, each player will be dressed in unique colour schemes, with their names hovering seductively above their heads on-screen (as opposed to "in their living room", obviously). You'll also be able to design your own decals using the DS's touch-screen then slap them all over your happy-wagon. The Mario Kart team is also pondering the use of the handheld's other special features - one idea that's been touted includes huffing into the built-in microphone to inflate balloons. Quite why you'd want to do this, we don't know yet - it likely relates to the game's traditionally balloon-tastic Battle Mode though. All will become clear when the title zips over the finish line some time around Christmas. IcedCube Special Limited Edition ! Team Xtender have brought out the best ever GameCube case yet - the IcedCube. There are 12 cool colours to choose from, transparent red, transparent blue, transparent purple, transparent orange, transparent black, transparent green, black, crystal, orange, purple, golden and silver. The IcedCube is of outstanding quality. You can put your orders in now at Divineo, to make sure you get yours first! Only 1000 of these IcedCube boxes have been made worldwide - here at Divineo we are taking PreOrders! Check all the IcedCube cases out in the GC Accessories Section. Earlier this year Bandai's Naruto: Saikyo Ninja Daikesshu 3 made the 'shonen' jump from GBA to NDS, and now Tomy's Naruto RPG series is doing the same. Centered around one of the most explosive events in the anime and manga, the story focuses on the duel between Naruto and Sasuke, unleashing their ultimate attacks Rasengan and Chidori. Using the DS's touch screen, you can execute ninjitsu attacks, and unleash summon animals (including Naruto's fearsome frog, of course). This can be done during regular adventuring or right in the heat of battle. Naruto RPG 2 also features an online mode via Wi-fi, allowing exchanges and confrontations between friends. Expected this week, this title certainly goes beyond a "mere" beat 'em up, with enough story depth to fully devote yourself to the Naruto universe, mobile style! For a fairly plump plumber, this guy sure can boogie down. Yes, Dance Dance Revolution with Mario has arrived, and pre-orders are being shipped as we speak. The beats begin right away when Toad takes a trip to Mario's place, and just as they are about to set off, oh no, the bridge is gone! So into the row boat they hop, and while poor Toad rows, Mario dances his way across the river. Soon the Cheep Cheep fish join in, jumping over the boat in time to the classic Mario theme, and as nostalgia swells up, it becomes clear this is a real party for Nintendo gamers. It's the first time the incredibly popular Dance Dance Revolution franchise makes its appearance on GameCube, and what makes this Ninty edition unique is the inclusion of a storyline, where someone has stolen the Music Keys and released the music they held. Without these keys, the unstable power of sound is wreaking havoc on the land. Mario himself must recover them before the chaos destroys the entire Mushroom Universe! The path to the keys is simple: Left, Right, Up, Down, Right, Down... Choose from famous Nintendo icons like Mario, Luigi, Toad, Waluigi, Wario and Bowser and clear levels by performing the correct steps. Once all the levels in a particular world are behind you, a Music Key awaits as your glorious reward. You guessed it: the path to victory is collecting all of the keys in the game. The colorful graphics are bursting with unmistakable Mushroom Kingdom charisma, and with no noticeable loading (just a million "warning" screens, haha), Dance Dance Revolution with Mario certainly has that polished Nintendo Disney-like quality. As you clear songs, you will unlock more tunes, minigames and much harder difficulty levels with trick steps and all. Split-screen mode allows the dance frenzy to be enjoyed by two players, where while depending on skill, the invitation to sabotage your opponent will certainly prove irresistible. With the US and PAL releases still many months off, new orders for Dance Dance Revolution with Mario with the Dance Mat are being accepted now, and are shipping within 24 hours. Preorders are already all on their way. The game has been tested compatible with the Freeloader (including game saves) on both US and PAL systems. Unconfirmed reports this week indicate that Nintendo is planning to launch a branded WiFi adapter which users without existing wireless network gear can plug into their PCs to let them go online with the Nintendo DS - and Revolution. The reports, originating from sources in Australia, suggest that the Nintendo-branded device would simply plug into a USB port on the user's PC and would allow the DS and Revolution consoles to access their respective online services. "Basically, instead of an accessory that will let you go non-wireless, this accessory will make your current Internet connection compatible with WiFi," according to a comment attributed to an unnamed Nintendo representative. While Nintendo UK today declined to comment on the reports - with a spokesperson telling GamesIndustry.biz that he could not comment on "rumour and speculation" - the plans would certainly fit in with the company's stated goal of having 90 per cent of DS owners using the online service. <a href="http://www.playeradvance.org/index.php?showtopic=12675&st=0" target="_blank" >Scawf</a> has released a new Breakout clone for the Nintendo DS. Thanks to Chishm, we now have source available for accessing the Compact Flash on the GBA Movie Player in DS Mode! Below is a link to the current .zip file containing the .c, .h, and .txt needed to use the GBA MP for homebrew! Good job Chishm. I have added FAT32 support. The FAT code is now complete and the only changes will be bug fixes. I have also updated the demos with the new code. Not a new dolphin release, but a new Input Plugin for Dolphin! The plugin uses SDL so you will need to download SDL and put it in the root folder of Dolphin. Currently only controller one is supported, others are internally disabled by Dolphin so I decided not to enable them in nJoy either. This plugin supports joypads/joysticks only. If you prefer the keyboard, just use the default plugins instead... Images for this plugin were provided by CoDeX (About) and vEX (Config). More information can be found in the readme.txt which is included in the zip file. <a href="http://www.playeradvance.org/index.php?showtopic=12675&st=0" target="_blank" >Scawf</a> has updated his Breakout clone for the Nintendo DS. I have finished the GBA Movie Player firmware hack. It will allow you to boot a single NDS or GBA file from your CF card. More details are in the zip file. It will only load homebrew NDS files, commercial demos do not work! This is intended to be used with a file select program, but none exists. Oh, and Dwedit has said that it corrupted his GBAMP, but I haven't had this problem. Use at your own risk. Caimans Video Codec is now available for the NDS. You can get a few movie trailers from the official page. It seems this "video codec" is a commercial product, probably it's still worth to check the trailers. Thanks to Kenzo Kabuto for the news. I ported an old console based yatzy game I made a couple of years back. I have not coded any C++ in years so to get into C++ and DS coding i am going to continue to port this game. First 2D graphics and then 3D is the plan. Free Express Shipping Worldwide for Nintendo DS Systems!! <BLOCKQUOTE>If Christmas means business, summertime usually means travel, long trips and cocktails on the beach, with the traditional umbrella coming out of the glass. What better moment than the sunny holiday season to join the handheld revolution, grabbing yourself up a Nintendo DS for your entertainment needs on the go? With this in mind, Lik-Sang is now offering you the chance to get your own NDS without actually paying for the shipping cost. That's right, after shocking the industry two years ago with the "Free Shipping Worldwide for all Games" offer, Lik Sang is now pioneering new horizons by being the first and only retailer on earth run a "Free Shipping Worldwide" service on Nextgen portable game devices. The promotion is valid for all standard systems shipping at Lik-Sang.com, including all Japan-exclusive colors, and is limited to the summertime, ending on August 31st of 2005 at midnight (HKT)* (please note that special limited editions such as Pokepark NDS, Electric Blue w/ Mario 64 DS bundle or the latest Mew Light Pink NDS are excluded from the campaign, because of short supply situation). The Free Shipping Promotion will not be performed using a slow no-name freight company: you do keep the choice with which shipping option you want to go, be it DHL, UPS, Global Priority, Airmail or EMS. At least one game must be purchased alongside the system. The Nintendo DS is the latest innovation from Nintendo in handheld gaming. Coming with two different panels, one being a touch-screen, the latest portable machine from big N aims at revolutionizing gameplay, opening new doors for creative concepts. As with all Nintendo portable devices, the systems are region free. This means they will play games from all over the world and vice versa. If you are living in a country with 240V power outlets, you should pick one of the universal AC Adapters ($4.99) or a USB charger cable ($4.95). Shipping is free, up to 60 US$. If, for any reason, your shipping bill is higher than that amount because you added other products (or if you are living on a remote island), your order will not qualify for the Free Shipping discount. There is also a limit in weight, marked at 3 kilograms. You can take advantage of the promotion to order along all the essential peripherals you need as long as you do not exceed any of these two caps. Also, if you are ordering software along your system, it does not even affect the total of your shipping bill at all, as the Free Shipping Promotion on games is still running and can be combined with the new campaign. More information at <a href="http://www.lik-sang.com/news.php?artc=3658&lsaid=219793" target="_blank" >Lik Sang</a>. I've been thinking about this for a while. remember that nintendo ON video, and its opening showing all of nintendo's past consoles? when I saw it (by that time it was a confirmed fake) I woundered why he showed them. then E3 came and Big N told us of revolutions backwards compatability. that's when I thought, "how will revolution be able to play virtual boy and DS" I then thought "well that nintendo on VR idea would work. then nintendo tells use no HD (I don't think I care too much) I think "well, it'd be hard to make hd VR glasses" (In the video though, It looks like the REV will be able to output to a tv& computer. It makes sense, safety wise, to have a nother display. so your friends can make shore you don't walk into a brick wall) and then the video shows an arrow pointing from a gamecube to REV an a mysterious box. I believe that box could be that wireless usb 2.0 router thing (the real nintendo on; on as in online) and you would need it to send stuff to REV (so the "gamecube" pic could actually be refering to previous gen games in general and the whole diagram explained what's needed to download the games on to REV) the router also could clarify some vague nintendo statements about what they wanted revolution to be (you know, they were some of the first REV details where they were talking about how they want REV to be wireless.) I think there's a likely conection between that VID and what REV will be. Fuzziqer has released the public beta of his popular Control Sim application for Gamecube. This application allows you to play several multiplayer GC games over the internet. The public beta comes with scripts to support the US versions of Super Smash Bros. Melee, Super Monkey Ball 2, and Sonic Adventure 2 Battle. Support for other games can be added by users. You can find more information about this application here. Haven't seen this posted here but there is a Lumines & Minesweeper for GBA clone called Luminessweeper, it was updated recently with music and is a great homebrew take a look. (21/7/2005) More sound changes, in-game menu (touch the screen). - Tutorial One slightly modified to display only X and Y coordinate on the touchscreen rather than the direct value from the touchscreen. - Tutorials two, three, four, five and six modified to use slightly different interrupt handling code as per the interrupt tutorial. - Tutorial six was modified to use 'padbin' to ensure that the appended GBFS file worked with release 14 of DevKitPro and it now uses the new key handling routines in the newer libnds. - Tutorials seven and above were also modifed to use the libnds key routines. Most of the SMS emulator are in working condition now, it plays Phantasy Star without a hitch which was one of the major reasons for making my own (and it has multiboot support also). Now I just need to make/get hold of a builder for it, anyone interested in helping out? Nightmare Troubadour: Players tap the screen to deal, draw and flip cards. The top screen plays out the action in full 3-D. Summon monsters and enter classic Yu-Gi-Oh! battles as players try to keep their life points from fading away. The game offers a "detail" feature that lets players zoom in and get more info about their cards. It's classic Yu-Gi-Oh! fun for fans of the game. Mega Man Battle Network 5: Double Team is a Nintendo DS adaptation of the Team Protoman and Team Colonel games. The show may have ended its run on Japanese television late last year, but Fullmetal Alchemist is still going strong in Japan. Fullmetal Alchemist DS (DS stands for Dual Sympathy in this case), the first DS entry in the Fullmetal Alchemist game series that has had a successful run so far on the PS2 and Game Boy Advance. Fully titled Fullmetal Alchemist: Dual Sympathy (Hagane no Renshinjutsu: Dual Sympathy in its Japanese form), the game takes the form of a side scrolling action game. Dual Sympathy has you use alchemy skills as you fight enemies, making use of standard attacks and "gimmick" attacks based off items located on the play field. The stylus is put to use as you draw your own alchemy spells on the lower screen. <a href="http://www.pdroms.de/file_details.php?fn=2523" target="_blank" >LiraNuna</a> has released a new early WIP Golf game for the Nintendo DS. <a href="http://www.playeradvance.org/index.php?showtopic=11515&st=60" target="_blank" >BeerSleep</a> has released the final version of his homebrew game for the Nintendo DS. Maxim has relased a VGM player for the Gameboy Advance. VGM is a music format used on systems such as Sega Master System and Colecovision. Thanks to Eugene for the news. Apparently an insider source called 'Teddman', has spilled the beans recently on the Gaming Age forums. They say he's trustworthy because he also made some other predictions, like Jak X Racing. Well, please take everything with a grain of salt, but here's the deal. "I got a chance to take a quick look at the current Nintendo Revolution controller prototype today--but unfortunately, no chance to take pictures. At first, I thought it was a Wavebird. That's because it looks just like a Wavebird, except that the GameCube face button scheme with the big A, small B, and X & Y kidney shaped buttons has been switched out for four small round buttons in a cross configuration, i.e. the traditional SNES/Playstation/Xbox setup. I believe the button color scheme used on the Revolution prototype is as follows: X (top) button = indigo, Y button = yellow, A button = green, B button = red. Instead of the "Nintendo GameCube" logo in the across the center of the controller, it said "Nintendo Revolution," using the same GameCube font. The analog sticks were placed in the same locations as on a GameCube pad, as were the shoulder triggers. Keep in mind I only got a brief look at an image of the controller (5-10 seconds) and it was a top-down view so I couldn't see what was going on on the bottom side of the pad. I was told that it'll evidently be wireless by default and no highly rumored special functions like gyroscopic technology or touchscreen pads were currently implemented or had even been hinted at by Nintendo. Also, "this is just a prototype, sometimes they change a lot before system launch, or sometimes, like in the case of the N64, the prototype was nearly the same as the final controller." At least this should at least put to rest all those bogus rumors about prototypes people have seen at developers' offices with touchscreens, gyroscopes, hologram interaction, etc. As it stands, this is all developers have access to." Konami Announces "Wallace & Gromit: The Curse of the Were-Rabbit"
Konami announced that it will publish the official video game based on Aardman Animation’s and DreamWorks’ “Wallace & Gromit: The Curse of the Were-Rabbit.” With huge free-roaming gaming environments, inventive action, plentiful gadgets, numerous mini games and humorous visuals that reproduce the distinctive look of the film, the game perfectly captures the fun, zany and imaginative world of Wallace and Gromit. The cheese-loving Wallace (voiced by Peter Sallis) and his loyal dog, Gromit, make their silver screen debut in “Wallace & Gromit: The Curse of the Were-Rabbit,” a tale of giant vegetables, terrifying lupine beasts, and inventions gone awry. The film centers on the annual Giant Vegetable Competition, which Wallace and Gromit have been protecting with their latest ‘Anti-Pesto’ company, which keeps rabbits away from the would-be winning vegetable. However, a huge, veg-eating beast starts to terrorize the neighborhood and is destroying the prize exhibits. Wallace and Gromit are hired to save the day. Konami’s Wallace & Gromit: The Curse of the Were-Rabbit video game closely follows the events of the Aardman and DreamWorks film, with players using cooperative modes to guide any pairing of Wallace, Gromit or their rabbit friend, Hutch, through four huge areas. Players are given free reign of the area as they attempt to solve the problems of the Giant Vegetable Competition. Their mission takes them from the seaside to suburbia as they venture out at night to confront the beast responsible for the vegetable-based carnage. "The game has given us the opportunity to create a more adventurous environment for the characters,” commented Nick Park, Creator and Director of Wallace & Gromit. “Deeper storylines, that couldn’t be accommodated in the film, have been developed are there ready to be explored. The Were-Creatures, for example, was a theme we would have loved to include in the film. I’m delighted to say that they are here in the game”. The game is developed in the UK by Frontier Development, the makers of previous of Wallace & Gromit video games as well as the acclaimed Roller Coaster Tycoon series. This will be available on the PS2, Xbox, Gamecube, Phantom, Playstation 3, Xbox 360, the Nintendo Revolution and the PC. We’ll keep you posted when more info comes out on any of these. This is only the beginning. Nintendo Revolution: The Last Stand? I was arguing with a friend recently with regards to Nintendo's upcoming new system titled the Revolution. I explained to him that having felt shafted by my investment in the Gamecube I could no longer trust Nintendo. I reminded him that when video game magazines were feeding us tidbits of info way back in 1995 about Nintendo 64, we were overwhelmed with excitement and anticipation. Looking back, I can easily count the number of great games that came out for N64 using two hands. Then came the Gamecube, gaming sites claimed it was the system that was going to redeem Nintendo for its lost years of providing loyal enthusiasts with the well-deserving hours of video-game gratification reminiscent of the days when Super Nintendo reigned supreme. But alas, once again as I look back, or in this case as I look at my stack of Gamecube games, I see that give or take a disappointment or two – enter super Mario sunshine and Mario Kart: Double Dash – I can easily count the number of great games that came out for Gamecube using two hands. Now, I will admit that I am certain the next instalment in the Zelda series scheduled for release this November will make up for a lot but this is my point: less than ten great games is not enough. I suppose that part of the problem is that Nintendo has been catering more and more to a younger audience hence we see less than three releases of the Nintendo champs such as Zelda and so many bothersome sequels to Mario Party. Regardless, now that Gamecube is nearing obsoletion Nintendo is going to have to level up its status and hopefully it can when the Revolution is released sometime in 2006. I somewhat feel guilty for trying to tackle the Revolution when we still no so little but it only seems fair since Xbox 360 and PS3 having been pumping the masses with raw synergy and hype. Apparently Revolution is the code name and not the official name (note, Nintendo said the same thing prior to the official release of the Nintendo DS). The system itself is about the size of three DVD cases stacked on top of each other and has a custom-built IBM CPU that we don't know anything about just yet. In terms of connectivity the Revolution has built in Wi-Fi meaning you need a wireless router - an innovative idea but also a risky one as not everybody has one. Just like with the Gamecube, you will not be able to play DVD's on it but a DVD support device will be sold separately. The case Nintendo is making with this – and I must say, I agree – is that most people own a DVD player nowadays and to manufacture the system without it makes it inexpensive to manufacture and inexpensive for the consumer; expect the revolution to be priced no higher than $350. The system will be backwards compatible, accepting the new 5-inch discs and Gamecube 3-inch discs. In fact, a cover on the top of the system opens to reveal Gamecube controller ports and memory-card ports. This is an interesting idea except one of the main reasons the system is named revolution is rumoured to be the new controller – of which we still know nothing about! This actually scares me a bit in view of the fact that I still haven't got into the swing of using the stylus with the Nintendo DS. Consequently the Revolution could be quashed before it starts, which is the fate of so many revolutions these days, if Nintendo gets just a bit too imaginative says I. But then again, Nintendo hasn't disappointed with controllers, console-wise so far. Unlike PS3 and Xbox 360 the Revolution is not specifically designed for HDTV as Nintendo believes most gamers could not care for it. Also worthy of mention is that the system has two USB ports, a first for a Nintendo system. Lastly, the Revolution's internet subscription will apparently be free, a move that could single handidly turn the tide in the ongoing console wars. Games from previous Nintendo systems as far back as the original NES will be available for download but this, I'm certain, will not be free. To finish, if you read my column a few weeks back in which I ranked the number one games for the current systems, I ranked Super Smash Bros melee the victor for Gamecube. Now, I've always said – and most people agree with me – that nothing would have been finer than an online multiplayer version. So although I've taken a considerable amount of time to condemn Nintendo for its mistakes with its current and previous systems, I will whole-heartedly admit that if done correctly, an online Smash Bros for revolution will undoubtedly give the Nintendo the best shot they've had in nearly a decade at completely turning the tables in the North American market; a revolution that is desperately needed. Nintendo announced a while back that the Revolution would be backwards-compatible, and at this year's E3 it dropped the bomb about just how backwards-compatible it is: the system will be capable of playing games from every Nintendo system released to date, including the NES, SNES, N64 and GameCube. The Revolution's online aspect plays into this as gamers will be able to download Nintendo classics released over the past twenty years and save them to either the system's built-in flash storage or to an SD card, which the Revolution will use for saving files. Third-party companies haven't announced their involvement with this plan, but it would be a shame not to see the likes of Capcom, Konami and others release their classics as well. Even still, the ability to play any Mario or Zelda console game ever released, in one place, sounds simply sublime. Classic games will be downloaded via some sort of online service that Nintendo will set up for the system. It's unknown how this system will work, how much it'll cost to play the games or basically anything else for that matter, but Nintendo has always been kept a very, very user-friendly focus to all of its products so the Revolution's online aspect should be no different. Getting the system online should be a snap as the Revolution will ship with built-in 802.11b and 802.11g WiFi support. Users with a wireless router should be able to hop online in a matter of minutes, maybe even seconds, if things play out as we expect them to. The Revolution's other online aspects aren't known at this point, though it's quite obvious that online multiplayer gaming will finally be a reality on a Nintendo console. The thought of taking the likes of Animal Crossing, Mario Kart, F-Zero and other Nintendo classics online is sure to have Nintendo fans already salivating. Im new and lost, to tell you the truth.....Anyways I was wonding if anyone knew of any Snes emulators that record sound, Im re-making a game in flash and cant seem to find one. Candidate builds using gcc 4.0.1 have been provided for all 3 toolchains. Please test and report any problems through the appropriate mailing list. The last day to submit is August 10th so you better hurry up and finish your game or application! Added echo/filter support! Makes a lot of soungs sound much better. Check the readme for other fixes. Download from the <a href="http://pocketspc.pocketheaven.com/" target="_blank" >Homepage</a> or our Pocket SPC page here --> <a href="http://nintendo-ds.dcemu.co.uk/pocketspc.shtml">http://nintendo-ds.dcemu.co.uk/pocketspc.shtml</a>. In Pac N' Roll, the inhabitants of Pac-World have been turned into spheres by the evil monster Golvis' Ghost Light. Pac-Man must roll his way through Ghost-Land, collecting pellets and confronting Ghosts to save his friends and restore peace to Pac-Land. Pac N' Roll lets players control Pac-Man with the Nintendo DS stylus. Players can roll and dash around diverse landscapes such as the Castle Pac, Gyro-Jungle and Flaming Fortress as well as execute maneuvers such as hairpin turns, immediate stops and precision rolling with effortless strokes of the stylus. All sites are rubbish without new and this site strives to be the very best in the Nintendo DS arena. So for now this will show up as a newspost but if you have any news for homebrew, emulation or pretty much anything with regards to the Nintendo DS then please post here. Help us make the biggest collection of sites for the Nintendo DS, we are looking for news, scene, coders sites and forums. Help Nintendo DS Emulation News become the best for Nintendo DS. Type of site: Nintendo DS emulation, homebrew, scene, hardware and sometimes commercial gaming news and download site. It was just over a year ago that i started this site to post news on the Nintendo DS and any happenings surrounding it, since then theres been a mass of Demos and homebrew games and some awesome hacks and advancements. The Passme and WifiMe are two of the highlights of the year. This site in its old state was tired and in need of a shake up and a more professional look. We now have a great new IRC page that links you to the DCEmu chat channel and every single bit of homebrew and emulation news is posted on this site, we also have a direct connection to the forums with the news so comments can be easily seen and responded too. Keep on visiting for the ultimate in Nintendo DS Emulation and Homebrew news. Here is another demo of the emulator. As you can see it runs a lot faster than the previous demo. The biggest problem right now is in CGB double speed mode. The emulator slows to a crawl. Oh well. Sorry about the lack of work, since I got a promotion at work, and also got engaged! Also note the second demo has a save feature (press start in game). It will save only to a non-commercial GBA cart, with any recent DS homebrew program on it. Nessie here ( I developed the mapEd tool ), just thought I would submit a fairly complete game demo that I had been working on about a year ago. I had hoped the game might attract some attention from publishers, but no such luck, so I figured the time was right to just release it for free to the community! God isn't yet a game but "only" a tech demo; I focused on the engine development rather than the gameplay, the reason being that I wanted to see what are the limits of the GBA (though, I also have my own limits ;-). Eventually it will be a real-time strategy / management game, a kind of mix between Dungeon Keeper, StarTopia and Monopoly Tycoon. - Support for sound and music (PCM & ADPCM). This tech demo allows the player to move around the map, and dynamically add and remove walls. The pathfinder is activated and finds the shortest path from the building in the center of the map to any of the 4 targets in the corners (the path is computed and displayed every time the map is modified). Shigeru Miyamoto, legendary developer (and snappy dresser) spoke with Electronic Gaming Monthly about his company’s upcoming baby, the Nintendo Revolution. While not much was learned from the interview (we still do not know anything about the controller), it is nice to hear some verification to what we had all come to assume, and that is the probability of Smash Brothers hitting the DS and Revolution (or, at least, they are ‘thinking’ about making a sequel to the greatest selling GameCube game of all time). He also showed interest in making sequels to Pikmin and Luigi’s Mansion. Miyamoto-san left some ambiguous words on the upcoming console’s DVD capabilities (it will be capable but will require an add-on to cut down on cost but it won’t be external add-on?). Also, there will be no ethernet port - purely wireless - but you can add one via a USB port. Of course, Miyamoto had to do some gloating - viva la Revolution, right? In terms of technical prowess, he calls the Revolution more than capable by comparing this generation’s Zelda games with ‘next-generation visuals’. If that was not fighting words enough, Miyamoto believes that the Revolution’s controller will become the industry standard. Of course, we kind of have to take his word at this point since we know nothing about it, except that it would work great with the game Pikmin. <BLOCKQUOTE>Nintendo and Sony are reporting that the DS and PSP are luring a new kind of consumer into the game-playing fold--more women and more gamers over the age of 25, the Asahi Shimbun is reporting. No-o Kitaeru Otona-no DS Training, a Nintendo DS game created by Tohoku University professor Ryuta Kawashima, has been a hit among older consumers. The game is based on a best-selling book about training the brain to operate at peak performance, and it features drawing exercises, simple calculations and math problems, and literary-based reading exercises. A Nintendo official claims, "We eliminated a barrier to playing the game." That barrier was making users, who were unaccustomed to using standard controller buttons, write on the DS screen instead. The game had sold about 205,000 copies through June, and 68 percent of purchasers were over the ages of 25, according to Enterbrain, Inc. and Nintendo. Women accounted for 42 percent of sales of Nintendogs for the DS, beating the existing percent average of women across all games purchased by women--which currently stands at 23 percent. Reportedly, Nintendogs has sold over 490,000 copies since its release in April. On the PSP front, 360,000 copies of Minna no Golf have been sold for the Sony handheld, making it the best-selling game for that system. Japanese sales figures show that 2.33 million DS units have been sold, along with a corresponding total of 4.4 million DS games. Almost 1.5 million PSP consoles have been sold, along with a corresponding total of 2.65 million games. Patater has begun to compile a list of NDS-related websites ranging from Development to commercial news and homebrewers websites. If you're looking for the best sites in DSDev, check out his list. Unofficial Goomba 2.2 /w Palette Editing ! <a href="http://boards.pocketheaven.com/viewtopic.php?t=2499" target="_blank" >Kuwanger</a> has released a new Unofficial Version of Goomba, the Gameboy emulator for the Gameboy Advance that also works on the Nintendo DS and Gamecube Gameboy player. <BLOCKQUOTE>Okay, here's a modified version of Goomba 2.2 with the ability to use a custom palette. You can modify this custom palette or copy the current palette under Display->. But you'll have to set "Palette: Custom" for it to be actually used (yea, that's a global setting). Oh, and you'll notice that the border now defaults to "Goomba". Hope you enjoy. Takes full size media, when fitted - allowing homebrew software to loaded via cheaper normall size DVD media. Moreinfo at <a href="http://www.divineo.co.uk/php/affstart.php?affcode=arboretum&prod=" target="_blank" >Divineo UK</a>. Gameboy Advance Micro release date... SET! Nintendo Japan has announced that Game Boy Micro will go on sale on 13 September to celebrate 20 years of Mario games. The diminutive version of the famed GBA will hit shelves across the Far Eastern nation with several different clip-on fascias and a selection of specially released software, including 20th Anniversary Super Mario Bros, Mario Tennis Advance, and a Dr Mario and Puzzle de Pon R double pack. The machine's price is yet to be confirmed in Japan, let alone the UK, but many are expecting this third incarnation of Game Boy Advance to be significantly cheaper than the £99 DS. Nintendo US has stated that Resident Evil 5 may yet be announced for Revolution, internet sources are claiming. Reports say that Capcom will be looking into releasing the game on other formats - including Revolution and PC - in the future. This follows the recent surprise announcement by Capcom that Resident Evil 5 would be coming to PS3 and Xbox 360 only. We will uncover the truth behind this story and bring you all the latest just as soon as we can. The DS community needs you ! A boonty about the TCP/IP support for Nintendo DS homebrew has been launched since several weeks. At this time it reached $ 1474.83 that is a great ! But it still need contributors and the goal is still not reached. A TCP/IP support will be an awsome evolution for our homebrew. Imagine multiplayer game or VNC control of your PC with your DS or tunneling for online play to every "lan" games. Please make the information spread around you and feel free to contribute even with few dollards via paypal. Thanks to http://miqds.free.fr/modules/news2/ for the news. Removed the need to have MSVCR71.dll. Vastly improved graphics emulation, using pixel shaders. Changed window title to show game name instead of file name (GCMs only). Added an option to turn debug logging off and on. It is off by default. Added an option to disable the syscall instruction, enabling Freeloader and Action Replay. Download and discuss. Oh, by the way, you might need d3dx9_25.dll. Just put it with the others. For the past few months there has been some confusion about the differences between ndslib and libnds. These two libraries are virtualy the same and only exist seperatly due to an issue we were having with CVS administration a while back. That being said i have finaly found the time to convert all my examples to libnds (for the most part this involved changing #include diretive to point to nds.h as apposed to NDS/NDS.h). That being said, i will begin updating libnds directly as most people seem to prefer that distribution. On another note I was inspired by a bit of work by Ethos and finaly got arround to converting some nehe sources. Lesson 1-11 are done and in both the ndslib zip (under DS/tools on this site) and the devkitpro examples cvs. I hope to add some text to go with these over the next few days. Since wntrmute has not put up a zip distro of the examples folder here they are temporarily. Most of the ndslib examples as well as the new nehe sources are included in libnds compatible form. Fixed some somewhat major bugs, one in particular that gets rid of a ton of sample errors. Also fixes a bug with loading some SPC's that caused them to not work. End result is this version sounds much better than the previous version. When analysts (accurately) predicted Sony would see serious losses, many Nintendo loyalists felt some schadenfreude at their archrival's suffering. Today, though, it was the house of Mario that saw its financial foundations shaken by lackluster earnings numbers. According to Reuters' Japanese service, Nintendo reported a 78.5 percent decline in operating profit for the quarter ending June 30, 2005. Its 13.72 billion yen ($123 million) in operating income was off 3.75 billion yen ($33.4 million) from the same period in 2004. While disappointing, the figures did slow the precipitous decline Nintendo reported in the January-March quarter, when its profit dropped 8.5 billion yen ($75.8 million). Overall, quarterly sales were off 14 percent, weighing in at 70.7 billion yen ($630.6 million). The slump can be attributed to two main factors. First was a dearth of games released during the quarter. While more than a dozen games shipped for the Game Boy Advance in the US, the North American continent saw fewer than 10 major GameCube releases, most of which were third-party ones available on multiple platforms. Indeed, the second major reason cited by Reuters for Nintendo's thinning profits involved sagging sales of the Game Boy Advance SP and the GameCube. The venerable portable only shipped 980,000 units during the quarter, down from 2.3 million the previous year. Sales of the console dropped an estimated 60 percent during the quarter, compared to the same period during 2004. The GameCube's slide was similar to--but greater than--the reduced demand for both Sony's PlayStation 2 and Microsoft's Xbox. Analysts blame the lessened interest on current-gen consoles on the looming launch of the Xbox 360 later this year and the PlayStation 3 next spring. They have also said that research and development costs for both next-gen hardware and software are also cutting into all three console makers' bottom lines. Though the news was not good for Nintendo, it was also not entirely bad. The company reported brisk sales of the DS, shipping more than 1.38 million games for the handheld in the quarter. The company told the BBC that it plans on shipping more than 12.4 million DS units by March 2006. NPD numbers released today showed that Pokemon Emerald for the GBA is the second best-selling game of 2005 in the US, despite only being released in April. Resident Evil (GC) was eighth on the list, and the Legend of Zelda: The Minish Cap (GBA) was seventh. Both games shipped in January. It also can't be understated that Nintendo saw a profit in its last quarter. By comparison, Sony Computer Entertainment today reported a quarterly loss of 5.9 billion yen ($52.6 million). Last week, Microsoft's Home and Entertainment division, which makes the Xbox, said it lost $179 million during its last quarter. Parasyte has released version 1.10b of his GCNrd tool. GCNrd is remote debugger tool for the Gamecube that allows you to debug games remotely, and it is commonly used to create unofficial Action Replay codes. You can find more information about this release here, and there is a thread to discuss this on the forums. Very interesting, indeed. So this narrows down the possibilities of the Revolution controller. Sorry, no electrical nodes the brain, it might scare the children. I was messing around yesterday and ported over the GBA 3D engine to the DS. It was pretty easy to replace the software textures with the hardware rendering. Yeti is a pretty nice engine and it looks like adding 3D model support as apposed to sprites will be pretty simple (frame work is all there if not exactly functioning). No emus run it so can’t do much for screen shots sorry. Yeti seems to have disappeared which is such a shame. It is a pretty powerful little engine that has great performance and nice graphics (a bit better than doom i would wager). If anybody knows where it is off to let me know. The SMS emulator is more or less finnished now and it will probably be called SMSAdvance, still no builder though, if anyone wants a preview version for Pogo just mail me. It's been updated, mapper 74 and 119 are added now. It also has kuwanger's cheat saving system with descriptions. <a href="http://mdxonline.dyndns.org/archives/nds/" target="_blank" >Infantile Paralyser</a> have updated their Nes Sound File player for the Nintendo DS, adding jpeg features to this version. Guests online: 726. Total online: 726.